The prices of clothes sold at Future Group's retail stores have gone up for the first time in 15 years. At least some shoppers should have turned away. Instead, Future Group MD and CEO Kishore Biyani says he is "very surprised to see" consumers getting used to inflation-led pricing. Rising prices have not deterred consumption demand. Future Group speaks predominantly for urban India, but rural and small town demand is also buoyant. For instance, Kochi-based V-Guard Industries reports a growth of over 60 per cent in sales of water heaters in north Karnataka's Hubli town in 2010/11, compared to the previous year. The company recorded an overall topline growth of 50 per cent pushed primarily by demand from rural India. Rising costs are not a worry. Says Managing Director Kochouseph Chittilappilly: "People are ready to pay." This optimism is reflected in the first-ever survey of business confidence commissioned by Business Today, which will be a quarterly feature. The BT-C fore business confidence index on a scale of 100, conducted in early March just before the shock waves sent by the quake-cumtsunami in Japan, is 74.8. 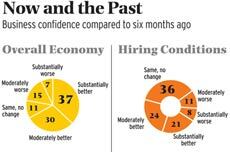 That means respondents expect business to be moderately better in the next six months. They were polled on the present business climate as well as on future expectations. More than 75 per cent of the 500 CEOs/CFOs polled by market research firm C fore said they expect profits to be either substantially or moderately better. More than half the executives polled expressed confidence that they would be able to increase sales even if prices continue to rise. Economists and analysts have expressed fears that, as persistently high inflation gets generalised in the economy and spreads from food and fuels to manufactured products through higher input costs, there would be a squeeze on corporate profits and gross domestic product, or GDP, growth would be affected. But companies such as Future Group, V-Guard and many others have been able to pass on the rising costs without losing sales or profits. Input costs inflation is not a profit spoiler yet. 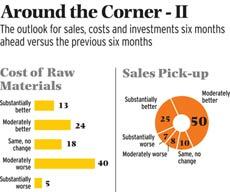 Companies in fact hope to leverage inflation to enhance their pricing power. How so? 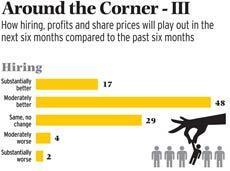 Unable to absorb rising input costs, companies mark up prices. But when they find consumer appetite intact they can continue to mark up prices even after inflation eases. So, while food prices will correct if the inflation ratedrops, Biyani does not expect prices of other manufactured goods to fall, "thereby ensuring higher profit margins". "When demand is strong, industry loves inflation," says R. Seshasayee, Executive Vice Chairman, Ashok Leyland. "That is the chance to hike prices." The pricing power that the strong consumption demand has handed to Indian industry seems to have, in turn, made it upbeat about business prospects, as reflected in the survey. Other pessimism-defying findings of the survey are: companies expect export demand to continue to improve, and that hiring is picking up and is also expected to improve. The BT-C fore survey, however, also captures some worries over rising interest rates and possible inflation in raw material costs in the next six months. "The survey adds to the body of evidence that shows strong consumer demand," says DBS Bank economist Ramya Suryanarayanan. She warns that the biggest worry ahead will be on account of supply-side constraints. T. Sreedhar, Managing Director of TMI Network, a Hyderabad hiring company, points to governments, both Union and state, readying for 2014 elections. "They will need to make massive investments this year... to derive value in terms of votes in 24 to 36 months from now, which is usually when most major projects take to complete," he insists. The findings come ahead of the announcements of financial results by listed companies for the January-March 2011 quarter. The general expectation from the results is that net profits of companies will see an erosion owing to high input costs, even as most of them post doubledigit growth in aggregate for the sixth consecutive quarter. Prices of base metals such as aluminium, copper, zinc, and lead are up between 22 and 44 per cent compared to a year ago. Thus some analysts feel the survey findings are "a tad optimistic", as Rajiv Kumar, Director General of the Federation of Indian Chambers of Commerce and Industry, puts it, more so because companies cannot exercise pricing power in competitive markets. Economists such as DBS Bank's Suryanarayanan also worry that the macro-economic environment continues to remain stressed. "A major difference between the periods 2004 to 2011, and 1998 to 2004 (run by two different governments) is the global challenge of high and rising global food and non-food commodity prices and erratic weather," she says. The corporate sector's optimism is based on huge unmet demand, especially in new markets beyond the big cities. The demand-supply mismatch allows for comfortable margins. More and more companies are looking outside the metros. "The Rs 3 lakh crore a year the Centre is pumping into developing rural markets and infrastructure is a boost," says V.N. Dhoot, Chairman of Videocon Group. Companies that are able to squeeze out more from every rupee spent cope better. The BT-C fore survey did not question companies on productivity but there is anecdotal evidence to show this. Himalaya Drug Company, a herbal products maker, has seen prices of ingredients it uses rise. Turmeric extract, for example, costs 48 per cent more than last year. Similarly, the price of ginger oil has gone up by 46 per cent. But Himalaya is coping well. "We are trying methods like better vendor control, better inventory management, etc., to contain costs," says Ravi Prasad, Chairman, Himalaya. Market research agency C fore sought responses to 27 questions from 500 CEOs/CFOs over the first 10 days of March, just after the Union Budget was tabled in Parliament. 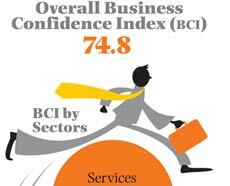 The average confidence level was calculated on a five-point scale which was further normalised on a 100-point scale. The survey was conducted in Delhi, Mumbai, Chennai, Hyderabad, Bangalore, Kolkata, Chandigarh, Lucknow, Nagpur, Kochi, Visakhapatnam and Bhubaneswar. 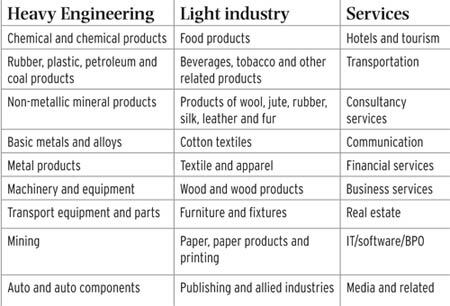 The companies are categorised as big, medium, small and micro based on their turnover.